Help CentreUsing SuperControl Managing enquiriesHow do I add an enquiry? How do I add an enquiry via Enquiries > Add? 1. To manually place an enquiry, go to Enquiries > Add. 2. On this screen you should add the contact details of the person that is enquiring. 3. Add the dates of interest, number of people, and properties of interest. 4. Notes for the enquiry can be added at the bottom of the page. We recommend you use Enquiries > Add when you have, for example, received a phone message and you want to log the enquiry. How do I add an enquiry via Bookings > Grid view? Grid view (Bookings > Grid view) can be used to add an enquiry if your guests have dates in mind but have not necessarily specified which property they want to stay in. It shows up all properties that are available on a single screen. 2. From Grid view, click on the requested arrival date, and select the number of nights, number of people, then "Place enquiry". 3. On the enquiry screen add the contact details of the person that is enquiring, add the dates of interest, number of people, and properties of interest. Notes for the enquiry can be added at the bottom of the page. How do I create a quote from Grid view? 1. Once the enquiry has been saved you will notice that a new section called "PDF Quotes" appears. This function allows you to create a quote to send to the guest by email. If you click on the "New Quote" button you will be directed to the availability search. 2. From the availability search you can specify the date, number of people, etc. 3. Click the "Search" button further down the page. 4. This will pull through all properties that are available for those dates and the search criteria. Once the properties display, tick which ones you would like to send in the quote. It's also possible to manually amend the price for a particular property if you wish to offer a reduced rate. If the price is reduced here, it will only show as a reduced price on this quote (i.e. it does not change anywhere on the booking calendars). 5. Once done, tick "Attach to quote" then click the "Attach to quote" link above the list of properties. 6. You will then be re-directed back into the enquiry page. 7. Scroll down to the PDF quotes heading where you will see that there is now a PDF link to show you have generated a quote. 8. Preview what the link looks like by clicking the link. The quote pulls through a property photo, description, the price that you're offering, and a book online link. The "Book online" link allows the guest to book online via this quote. How do I add an enquiry via Bookings > Availability search? Another way to take an enquiry is through the Availability search. 2. Here you can use the calendar to search available dates, number of people, number of bedrooms, country, town, etc. 3. The search results will show up which properties are available so that you can let the customer know which properties are available on the requested dates. You need to know the dates that your guest is requesting to do the availability search. 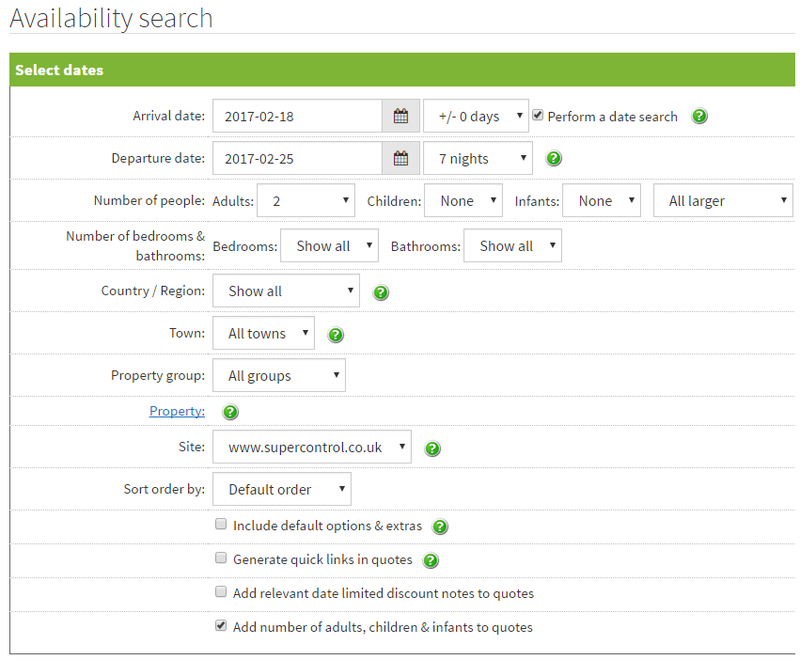 The availability search works well if you have a large number of properties (more than 15) and you want to filter availability by, for example, Country, Town or Property group. Please note all of the above options (Enquiries > Add, Grid view, or Availability search) will work to check availability, and it is really up to the individual to find their preferred way. It's always important to enter the number of people however, otherwise the low occupancy discount or per person pricing might be applied in error. How do I create a quote from the availability search? 2. Here you can search for available dates. 4. To generate a quote, input a price/value corresponding with the selected property. 5. Tick "Attach to quote". 7. Then "Attach to quote" link (above the list of properties). 8. Your quote will be generated as a PDF. Next: How do I edit an enquiry?